I'm pretty sure pumpkins look forward to Halloween all year. They know they'll get to dress up and look scary and remind us what wonderful characters they are. This is the pumkins favorite holiday; mine, too. There's no guilt about gift giving, no worries over fireworks or fake Christmas trees vs. real ones. Halloween is simply a time to have fun, to remember our ancestors, eat candy and put on a costume. Pumpkins do all of those things really well. Today is Molly's 10th birthday. 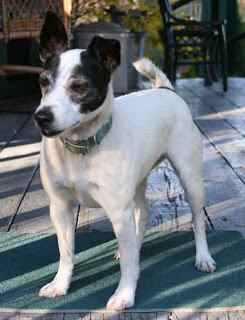 She celebrated the ending of her 9th year last night by saving the chickens in the barn, from a 'possum. Mr. Possum goes in at night and eats chicken food, and sometimes eats a chicken from time to time, so Molly saved the day. She'll get a special treat this evening. 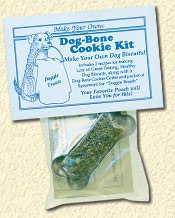 Maybe a homemade doggie cookie from our Doggie Cookie Kits. This week we've been celebrating the garden in another way. Our chef friend, Eddie, and his friend, Gregg, have been visi ting from California. Eddie stayed with us several months almost 4 years ago and cooked some amazing meals. I knew little about Chinese cooking back then and it was the during the time I was working on my book, Easy Dips, Using Herbs. Eddie taught me how to make wontons from scratch, including a pepper dip I've grown very fond of. (You'll find his recipe on page 92 of the book). While he was here, and cooking anyway, he decided to check his recipe in the book. It's pretty basic, some fresh and some dried peppers, shallots or onion, chopped fine and cooked in some oil until t he color of the peppers change. Then you add rice vinegar, brown sugar and sometimes ginger and cook it down by about half. It keeps for weeks, although we usually eat it up much faster. Eddie browsed the garden like he used to when he was here visiting before and gathered rainbow chard, green malabar spinach, peppers and a few other things for dinner. I gathered a couple of handfuls of figs, a bunch of small achochas (I've written about those several times here before) and nasturtiums for the salad. So here's the menu that resulted: Eddie made my favorite Chinese soup, which consists of chicken broth with ginger and garlic in which he cooked Chinese meatballs (pork, ginger, dill, garlic, shallot, pepper); he stuffed some jalapeno peppers with the same mixture and sauted it. The soup was poured over noodles and topped with chopped green onion and cilantro. I chopped up some garlic, ginger and shallots, added some raspberry jam, brown sugar, rice vinegar and marinated pork ste aks in that. I grilled the pork steaks, and near the end of cooking those, I split the figs in half, brushed them with vegetable oil and grilled them for about 2 minutes on each side. Grilling carmelizes the sugars in the figs and they are very tasty. Eddie took the baby achochas and sauted them in some oil with garlic for about 5 minutes, then added a half cup of the soup stock and simmered it until the liquid was absorbed. The achochas remained somewhat crisp and everyone liked this method a lot. 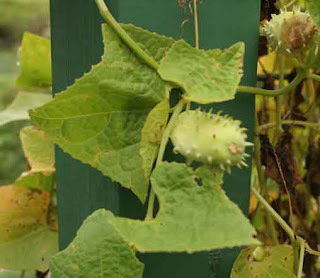 (Nichols Garden Seed will be offering achocha seed next spring from my crops). We invited over our friends, Brent & Tammy, who also like to cook and seven of us feasted on and incredible Chinese dinner. We finished the meal with a pear galette, from the Keiffer pears from the orchard behind the house. You might enjoy Eddie's blog (called Chef Chong's Leftovers), which has lots of his food and recipes. Recipes for this meal will be on my Recipes page in a few days. Enjoy Halloween, with friends and good food, or your favorite Halloween candy. Our just stick your face in the window and grin like a jack-0-lantern! Last August I posted my observations in my blog posting, on a roadside corn field which had ears where the tassels should be. Friends at the Univ. 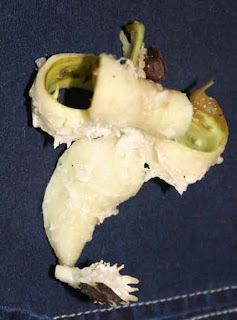 of Illinois commented and explained that some corn varieties, in cool, wet years, may have a few of these errant ears. This field, however, was filled with this oddish corn. I was curious how the corn had fared and last week, went back to look over the field again. I noted that the field is slightly over one fourth mile long on one side, and my guess is it's an 80 acre field. Because of the long, wet fall weather, the corn had not been harvested. I noticed that the corn ears, both at the top, and the normally placed ones lower down, had matured somewhat equally. 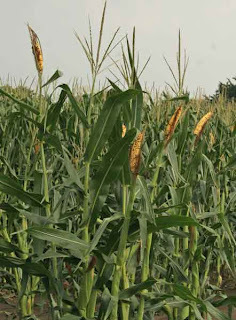 The tassel-ears weren't as fully filled out, but most of the stalks had one or two fully filled ears at about waist level in addition to one or two ears at the tassel level. The photograph, directly below, of the two fields together showed each field had reacted differently. The field on the right, just feet away from the weird corn field, was normal. No odd looking corn at all. Notice in the second photo, the normal field view, all of the ears grew at about the top level o f the fence posts (the road where I photographed was a bit higher than the ground level). Those ears, going on for about a half mile, were all exactly in the same position on the corn stalks with none at the tassel level, whereas, the field just to the north of it, had ears at the tassel level as well as approximately waist high. So the theory that this aberration was from weather/cool/moisture, doesn't completely hold up, or else, both fields would have reacted similarly. And both fields had corn maturing at the same time. It appeared the mixed up corn went a considerable distance into the field, although I could not be certain as the field was too muddy to walk into. But as far as I could see into the field, weird corn was the norm. Often the seed company that sells the seed corn to the farmer puts up a sign somewhere along the edge of the field to identify, and advertise the seed variety, but I could find no signs at all and couldn't locate the farmer to ask about the variety. I'm sure the seed corn company would not want to advertise even their name, with this throwback corn as it's not a desirable trait, although highly entertaining while driving along the highway for us strange plant watchers. The bearded tooth (I've always known it as "bear's paw") mushroom grows about shoulder height, looks a bit like a white, fuzzy kitten stuck on the tree from a distance. Up close it's more like a smooth-topped mushroom with white fringe beneath. These are very tasty mushrooms, used in soup, or my favorite way, sauted in butter. Simply slice the mushroom in half inch slices first. Another way I like to fix these is to dip the slices in buttermilk, then dip them in fine cracker crumbs and fry until it's crispy on the edges. The flavor is mild, very pleasant and this is one of the really good fall mushrooms in the Ozarks. But, always be absolutely certain of the identification of a mushroom before eating it. Check this site for good information about identification. If you like wild mushrooms, we offer locally grown and packaged wild woodland mushrooms. The Ozarks Forest Mushroom Medley mixture contains morels, chantrelles and several other tasty spring and summer mushrooms. We offer them through our catalog but not on the on-line catalog, due to availability and supply. If interested, go to our Contact Us page of the website and give us a call because we currently have a good supply. They're easy to use, with complete directions on the box and these work well in soups, as well as in sauces and toppings for steaks and chicken. I'm still harvesting things from the herb beds every day, knowing that event ualy frost will come. As of today, no frost yet and it would be great if we can go to the end of October frost-free. You may notice along the right side of the garden path photo in the raised bed, the basils are still looking relatively happy although the cool nights have slowed leaf production. It's been an outstanding basil production year and I have not dried, frozen or preserved one single leaf and will regret it come the cold of winter. Happy gardening! We were honored and pleased to have our friend and last summer's intern/WWOOFer, Adam, come for a visit this week. Last summer he kept the garden in fantastic shape, planting, tending and harvesting throughout the season. Adam shares my passion for good food and cooking, so we cooked the garden all season long. Adam came to Long Creek Herb Farm a year ago last May, when I was still recuperating from my January surgery. He was a lifesaver for the garden! We convinced him to stay the summer and see the season through and enjoyed his wonderful spirit. From here he went on to Washington state to work on an organic production farm. He was only home for a short while to visit his father, and came by to see us. I was a bit embarrassed to show him the garden. With some back-pain issues this summer, and constant rain, it didn't look dressed and ready as it had when he was in charge. 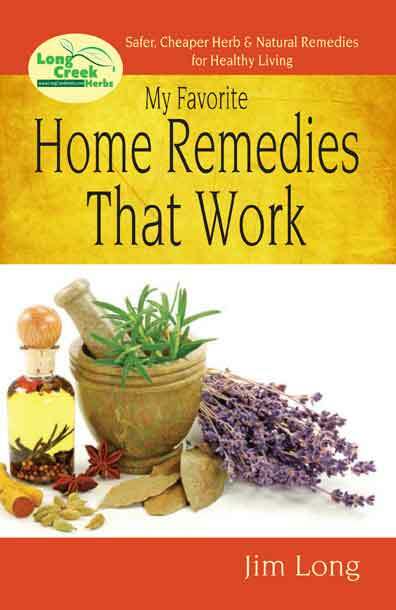 He harvested peppers, lemongrass and a variety of herbs to take back with him. 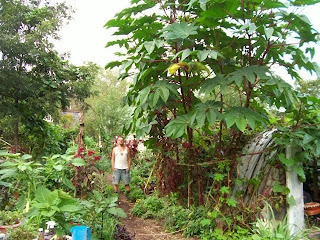 Our friend, Arne Arnsteadt, an organic grower in Ava, MO, sent this picture of his giant castor bean plants. He's dwarfed and looks child-size under the enormous canopy. He cut them down yesterday, resorting to a chain saw for the job. I've been harvesting the pepper crop, trying to keep ahead of frost. We generally don't have a frost until Halloween, or after, and lots of fingers are crossed that will be true this year. My figs will ripen if they have another 10 days of warmth. This week it's been in the upper 70s and sunny, so the figs are racing to get ripe. 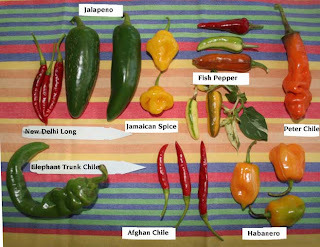 Here are a few of the pepper varieties I grew this year (click to enlarge to see the labels). My favorites this year include Jamaican Spice, Fish Pepper and a new one, the Elephant Tusk. I also grew a few plants of the bhut jalokia. If you were following last year you may recall that a jalapeno pepper is rated at about 2,500 ~ 8,000 Scoville Heat Units (SHU), a cayanne is rated at 30,000 ~ 50,000 SUs while an orange habanero is rated at 150,000 ~ 325,000 SHU and the bhut jalokia (also called naga jalokia) clocks in at a whopping 800,000 to 1,041,000 SHUs! While a habanero pepper has intense heat, it also has flavor, especially when moderated with mango, pineapple, peaches or cream, but the bhut jalokia has little flavor. It's simply the hottest pepper in the world, according to the Guiness Book of World Records. Here's what they say: "It was measured at 1,001,304 Scoville Heat Units (SHU), at the New Mexico State University, Las Cruces, New Mexico, USA, on 9 September 2006." So why do I grow it? Because I can! Someone asked me on Facebook what allspice looks like, so I took photos today of my allspice, bay rum, lemon bay rum and cinnamon. These are the great little rooted cuttings I found when I was in Florida last February and they've grown a great deal this summer. I use the leaves for seasoning. With all 4 plants, I like to crush a couple of leaves in some heavy whipping cream and let it sit overnight in the refrigerator. Next day I remove the leaves, whip the cream and add a bit of sugar. It's very tasty! The leaves work well in cookies and other desserts, too. I moved all the plants out of the sunporch yesterday and sprayed each one with ultra-fine oil spray. I'd sprayed once already but it rained before I got the plants indoors and washed off the spray, then it turned cold. Within slightly over a week, mealy bugs had formed a community on one of the unsprayed plants, so to be safe, everything went out for a complete spraying. Now they're all tucked inside. They'll go out and get sprayed several times during the winter to prevent bug problems. Our cat, Squeak's daybed is right under the orchid shelf, just below the cinnamon and allspice plants. She whiles away the daylight hours curled up, dreaming. One of my other jobs today was photographing some of our products. Our website is getting a complete make-over and the webmaster wanted fresh photographs. 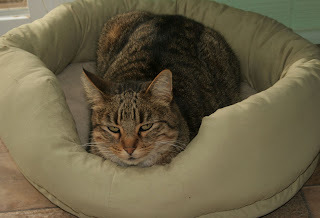 Squeak got to be a model for the Purr-fect Catnap Pillow with Catnip but she got so excited it interrupted her nap. I also took several photos of our various Dream Pillows and the Cat and Dog Cookie Kits, too. If y ou're a retired English teacher and my occasional grammatical error bothers you, I'm sorry for that. I'm mostly sorry you can't read for content and intent, instead of criticism. I work long days, I stay up late, updating my blog. (The definition of a blog is, web diary, my thoughts, written to share). If you want to obsess over writing, check the writing format for Twitter messages. Language is a living thing, it grows and changes with the times. Now, like Squeak, I really am off to dreamland! Happy gardening to all and thank you for checking in. We've had more than 6 inches of rain in the past 10 days. It's too much, let's share some of it with folks who don't have any. It's cold at night and the last of the summer's plants aren't a bit happy. The figs aren't ripening - they need our normal 70 degree days to finish up before Halloween and get ripe. The muscadines, too, are just looking a bit bewildered. All of the basils are dropping leaves, not happy with upper 30s at night and 40s & 50s in the daytime. Plus the rain. It just keeps on coming and the ground is like a big, wet swamp. No frost yet, but it's been found just a few miles away. 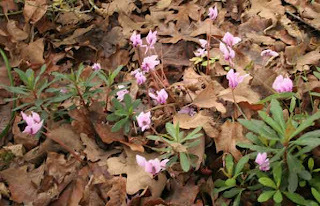 The hardy fall cyclamen are happily blooming away, oblivious to the out of season weather. 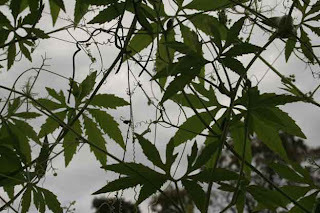 I noticed today their flower stems, before blooming, are like coiled springs. 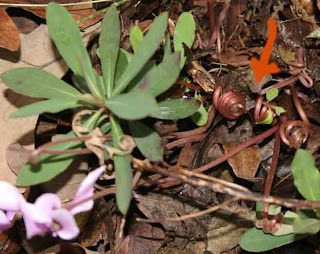 Click on the photo to make it larger and look at the point of the arrow and you'll see the coiled up flower buds, ready to burst forth out of the leaves. I don't think I ever noticed these coiled buds before, although the larger houseplant variety of cyclamen does unfurl as the buds come to the top of the leaves. (That's not a cyclamen leaf in the photo, but instead, a euphorbia variety). The myoga ginger ( (Zingiber mioga) is also blooming in spite of the weather. 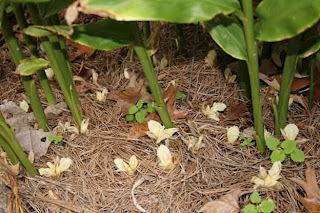 Myoga is the most cold hardy ginger and it generally blooms in the heat of early September. The flowers you see here at the base of the plant stalks are the parts that are used, rather than the, "hands" or tubers. The mild ginger flavored flowers are used in anything where you would use fresh ginger. I've grown two varieties of achocha this year, both coming from a friend in Bhutan. He collected seed for me last year and I'm surprised how different they are. One, the bright green, deeply lobed leaves, look exactly like the achocha another friend brought me from Brazil some years back. The second variety, collected by a friend from the Bongo Valley of Bhutan, doesn't look at all like the first variety. Th is one has a quite different leaf and the fruit is shorter, fatter, and ripens much more rapidly. Oddly enough, this Bongo Valley variety, pops open into something that looks like an orchid flower. The vines sometimes look like they are in bloom, when it is actually these seed pods after o pening into 3 sections, each one having seed on the tips of the "orchid petal." I'm not giving up to the frost yet. Like the last grasshopper, fiddling away, ignoring the warnings, I will hold off bringing in the last few house plants until the frogs in the pond quit chattering and when the crickets' songs slow down to just a squeak, then maybe, I will admit that frost is eminent and watch the last of the garden die away. Not just yet, though! 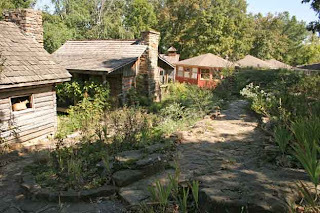 Fall is a great time to visit the Ozark Folk Center's Heritage Herb Garden. It's been a long time since I was last there. Back in 1984, the Committee of 100 in Arkansas, hired me to design a new garden for the State Park. Billy Joe Tatum had already established an authentic homestead garden, and we were to build upon her early work. With little funding and a State Park Director who didn't want an herb garden, I managed to implement the beginnings. 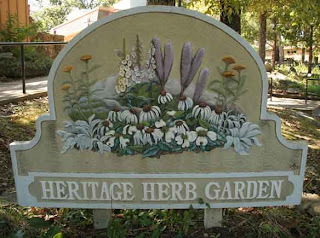 I named it the Heritage Herb Garden, because it was created to document and preserve the plants that were on homesteads between 1830 to 1930 in Arkansas. The Director "allowed" the Committee, and me, to have a tiny, north-facing slope, filled with bermuda grass for that first stage of the garden. He promised, but never delivered, stone masons to execute the handicap-accessible walkways and planting beds. Without workers, I layed the stones myself. A back injury during the process ended my participation, and in a round about way, gave me a new direction in life. It was that time, laying flat on my back in bed for most of a summer, unable to sit at my drafting table, or even walk without using a chair for a walker, that I bought my first computer and began writing. Hillary Clinton dedicated the garden in 1985 and from that, she became a customer of ours. In 1986, the Folk Center hired Tina Wilcox as Head Gardener and through her guidance, the garden has evolved into a much larger, vital and interesting teaching garden for children and adults alike. Tina took those very small beginnings all those years ago, and has made the garden home to plant collections and season long activities. One of Tina's annual projects for the garden is the Fall Harvest Festival, which is the reason I was there. 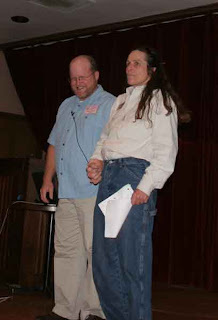 My part in the Festival was to plan the menu and recipes for the kickoff Herbal Extravaganza Dinner, and to give 3 programs during the 3 day Festival. My menu focused on local foods. I'm a supporter of the Slow Foods movement, which encourages the use of local foods, rather than imported. 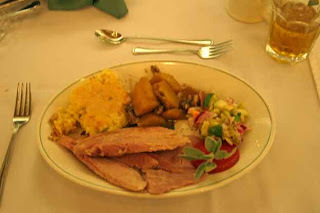 Attendees had a choice of Dry-Cured Ozarks Ham, Fennel-Stuffed Trout, or Meatless Meatloaf. Side dishes included Fall Harvest Relish, Baked Butternut Squash with Apples and Walnuts, and Grandma Garrison's Corn Pudding. The first cour se was Curried Pumpkin-Apple Soup, followed by a Field Greens Salad with Creamy Basil Dressing. And for dessert, a choice of Double Chocolate Chess Pie or Buttermilk Pie. I hadn't anticipated how difficult it would be for the kitchen to find dry cured Ozarks hams and after a lot of searching, I found some in Missouri. The trout, too, was difficult to obtain but I found 40 at the Bear Creek Trout Farm near Harrison, AR. The dinner came off well, people were well pleased and asked for the recipes. Henry Flowers, who is the head gardener for the late Madalene Hill's gardens at Festival Hill, near Roundtop,T X, gave a program, "Roses are Herbs, Too." My program, "How to Eat a Rose" was just before his. 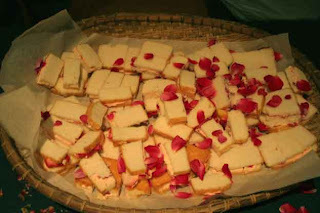 Along with my program, I provided Rose Cookies, Black Tea & Rose Tea and Rose Sandwiches. 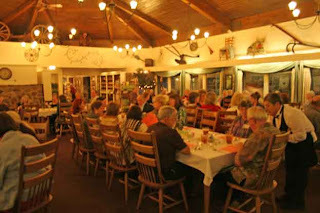 The Folk Center showcases crafts and culture of the Arkansas Ozarks. Local musicians perform several nights a week in the auditorium; craftspeople demonstrate traditional crafts. 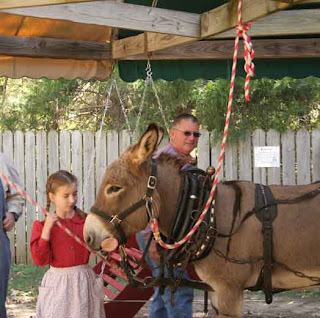 There are mule-pulled merry-go-round rides for children, lots of plants, games, musicians throughout the grounds and a restaurant that does the State Park proud. I always feel like I'm getting a small view of what the Ozarks was like, many years ago.